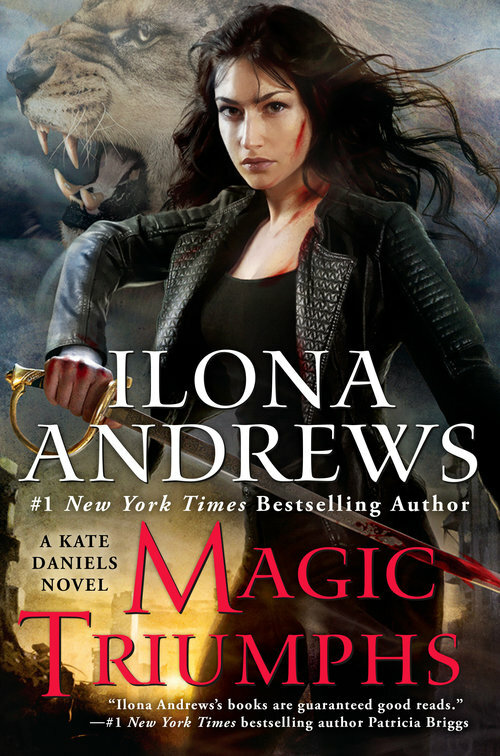 "Thrilling ending to a truly epic urban fantasy series"
It makes me want to cry as I type that MAGIC TRIUMPHS is the end of the Kate Daniels series by writing duo Ilona Andrews. MAGIC TRIUMPHS is all that fans could hope it would be. Nail-biting action, danger, community, and snark - everything we've come to expect from these amazing can't-put-it-down books. MAGIC TRIUMPHS is book ten in the series, and is the close of the Kate Daniels and Curran Lennart storyline. As the authors have said, "Kate and Curran deserve their HEA. They worked very hard for [their] Happily Ever After." I'm thrilled that we're not done with the KD world, though. There are still two more books in the Iron Covenant series to come, following book one in Hugh d'Ambray's arc IRON AND MAGIC. MAGIC TRIUMPHS finally brings us to the looming battle between Kate Daniels and her father Roland, who is a god- like being who has lived for centuries. Roland is a truly evil dude, and Kate grew up hidden from the sadistic warlord until she had to step forward to defend her family and friends by sword and magic from her evil dad. The tension between these two has been ratcheting up over many books, and it's a relief to have the confrontation finally occur here. Following Kate throughout the series, we've watched as she changed from a loner mercenary to a mate in love with the Beast Lord, Curran, with whom she co-ruled the Pack of shifters in Atlanta. Now we see Kate evolve further into a mother, one who will do anything to protect her son and her mate from the threats that face them. The evolution of her character has been awesome to experience. Thankfully, her ability to have her mouth get her into trouble hasn't changed too much, because that's part of what is so enjoyable about Kate. I dearly love the high level of snark and humor that the authors employ. Every book I read by them ends up highlighted from beginning to end because of so many enticing turns of phrase and things that make me guffaw out loud in public. These books deserve every superlative that's been thrown at them, and how. Kate Daniels is a thrilling series full of magic and sword fights, brotherhood and sass. MAGIC TRIUMPHS truly does triumph, captivating the reader from the first second of action to the highly satisfying end.